RBI Assistant Mains Admit Card 2019: The Reserve Bank of India had released a notification for the candidates who had completed their graduation. The applicants of the vacancy are informed that as per the selection process the date for the preliminary exam is heading on. The RBI Assistant Mains Exam Date 2019 updates soon. The candidates are informed to download their admit cards. For detailed exam instructions and RBI Assistant Mains Exam Admit Card 2019 Download read the complete article. Latest Update: RBI is going to conduct the Assistant Mains Examination 2019 in the upcoming months. Candidates can download the exam admit card from the official website before the last date. (आरबीआई सहायक प्रवेश पत्र): The selection of the RBI Assistants will be through the pre, main and skill test. For now, the preliminary exam has been scheduled for which the call letter will be available 10 days prior to the exam date. The candidates who had applied for the RBI Bank Vacancy can download their RBI Assistant Online Exam Admit Card 2019 through the official website. However, we have also provided a direct link to download the RBI Assistant Call Letter 2019. Click on the link of Opportunities from the end of the page. Click on the option of Current vacancies from the menu. Call letter option will pop up from the menu open it. Click on the link of Download Admit card from the menu. Enter the registration number and date of birth. As per the released notification the candidates the applicants have to appear in the Preliminary exam. The exam will comprise of 100 questions to be answered in one hour. The subjects to be included will be English, Numerical and Reasoning. The candidates can prepare themselves for the exam as per the tentative Reserve Bank of India Assistant Exam Date 2019 provided by the department. Kindly refer to the table for more information. The Reserve Bank of India Assistant Call Letter provided by the exam will contain the information such as venue of the exam, time and the roll number. The candidates will be able to download their result only through the details provided in the admit card. 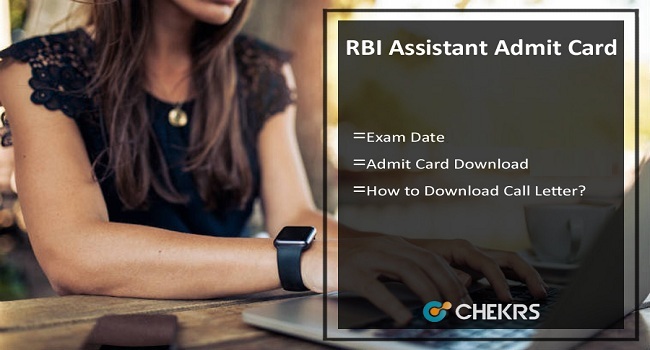 For latest updates on the RBI Assistant Mains Admit Card 2019 bookmark the page jobs.chekrs.com. For asking question comment in the section given below.